Wayne Hasson became certified as a YMCA Open Water Diver in 1967. In 1972 he earned his Coast Guard Captain’s License as an Ocean Operator. That was also the year he worked 80 hours underwater salvage diving the USS Picket the Civil War Iron Clad sunk in the Tad River, Washington, North Carolina. In 1973, while serving with the United States Marine Corps, he became certified as a NAUI Instructor, completed Navy Dive School, and certified over 500 divers during his time in service. Come 1978 Wayne had other ideas, so he took his Honorable Discharge and said goodbye to navy life. In the Marines Wayne made a decision about what he wanted in life. 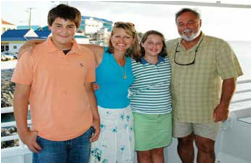 Acting on that decision, from 1976 until 1979, Captain Wayne Hasson was the owner/Captain of the first charter liveaboard M/V King Mac operating out of Moorehead City, North Carolina. By 1980 Wayne had relocated to the Cayman Islands taking over man- agement of the Casa Bertmar Dive Resort. While on Cayman from 1980 - 1984 Wayne became involved in all aspects of the island and tourism. He organized and taught the first after-school dive training course for Cayman youth, created the first underwater petting zoo, photographed underwater for the Department of Tour-ism, and hosted snorkeling familiarization trips for travel agents visiting the islands, and he met and married his wife Anne. Still, the vision of a fleet of diving liveaboards was always on the fire cooking. In May of 1984 Captain Wayne Hasson introduced the first Aggressor to the Cayman Islands. That year Pres- ident Adrian Biggs of the Cayman Islands appointed him Chairman of the Cayman Islands Mooring Project. Wayne’s company funded and installed over 100 mooring sites in the Cayman Islands. Wayne was a part of every mooring installation. What spare time he had that year he spent with Peter Benchley and David Doubilet on a National Geographic story. Always busy, the years passed swiftly. Wayne serves as Captain of the Cayman Aggressor, Cayman Aggressor II, and Cayman Aggressor III. In his spare time he still gives to the Cayman Islands working with the Search and Rescue team, the Police, and the Port authority with several rescues at sea to his credit. He is always giving of his time and himself. In the mid-nineties he was the point person acquiring Russian War Ship #356 in Cuba to sink as a dive site at Cayman Brac. As a pilot/owner ,Wayne now gets to fly his plane back and forth to Cuba every other week until the boat was ready, cleaned of obstructions, hatches removed, then sunk in place. Mahatma Gandhi observed: The best way to find yourself is to lose yourself in the service of others. Wayne Hasson exemplifies the nature, merit, and value of such service. 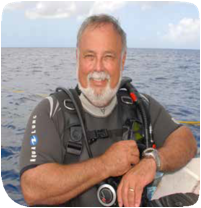 To the dive industry, Wayne served on the DEMA (Dive Equipment & Marketing Associ- ation) Board for five years, three as Vice President, five as committee chair, organizing career fairs, an Ocean Career Day Guide, and a Deep Ambition Career Fair. 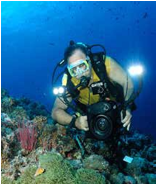 He served on the NAUI (National Association of Underwater Instructors) Board for three years. Later, when he and his family moved from Cayman to Naples, Florida, he joined the local Rotary because of their motto: Service before Self. He served ten years with the Rookery Bay National Estuarine Research Reserve in Naples, Florida running a summer lecture program and mentoring shark tagging with grade school and university students. He used his talent as a pilot and mentor in the EAA (Experimental Aircraft Association) Young Eagles program introducing over 100 Cayman boys and girls to aviation. When not photographing and shooting video underwater, hosting youth camps for the cognitively impaired, he is filming or directing movies, and assisting in feature films such as the Abyss with James Cameron. Wayne’s awards and recognitions are many, and come from many sectors of the world. Scuba diving of course for in ad- dition to the Aggressor Fleet, he is the founder of Oceans for Youth. Then, as an inventor he owns a US Patent on his Sasy (Supplied Air Snorkeling for Youth). As a videographer you have seen his videos on CNN and Fox News. As an aviator and environmentalist he spent much of his time conserving our world and mentoring the young. Today the Aggressor Fleet boasts twenty-two liveaboards in the major diving centers of the world. Captain Wayne Hasson saw his vision not just come alive and blossom, but bloom through the civilized diving world. Beneath the Sea is proud to recognize Captain Wayne Hasson as their Legend of the Sea for 2018. Not only for the strength and character that made his vision live in the Aggres- sor Fleet, but for his continuing service that caused him to serve, mentor, and motivate the youth of two countries.